Danny and his mother move from New York to Hawaii right before Pearl Harbor is attacked. What would it be like to live through that part of history? Each book features a young person at the center of a disaster, and the books are fast-paced. Many of my students have eagerly read through the entire series, even though they feature all different characters from locations and time periods as different as 79 A.D. in Pompeii to Joplin, Missouri in 2011. This books are fairly simplistic, with 86 pages, fairly short sentences, and a linear series of events. However, they are well-researched, and some provide appendices at the end to offer readers more details about the topic. Although the series is not highly literary, the writing is appropriate for younger readers and easily accessible to reluctant readers in upper grades. While each book references a disaster, the treatment of these holds student interest without being graphically violent or fodder for student nightmares. 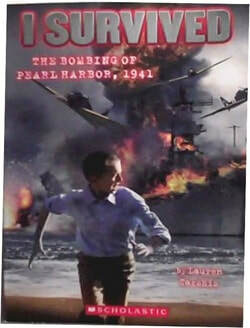 The books also attempt to show some different points of view with regard to each setting - for example, in the Pearl Harbor book, the main character befriends a Japanese family before the attack, and the book makes reference to Japanese Americans being jailed as suspected spies. This series is a great introduction to historical fiction, and it offers some more details about historical events that students may already be interested in. "Through a curtain of smoke across the harbor, Danny could see planes pummeling the battleships, flying low, firing their guns, then circling back for another attack."